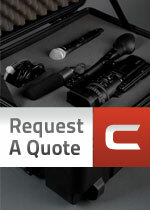 To receive a quote on a fabricated case fill in as many of the fields as possible. This form is designed to give us an idea of what your needs are prior to contacting you. After filling out the information below, one of our team members will call to discuss additional options, prices, and tailor a case custom to your needs. Quotes will be based upon the information given. Please be sure to give accurate information. Even slight changes in dimensions will alter the price. When measuring equipment please be sure to include any protrusions such as knobs, connectors or handles. If you are unsure of how to measure for a case, visit our Case Measuring Guide.